EconEdLink - Inflation and Unemployment - Is There a Correlation? Inflation and Unemployment – Is There a Correlation? Students view a video on inflation and are introduced to the concept of unemployment. They then utilize Excel to create scatterplots, regression line equations, and correlation coefficients (r) for inflation and unemployment data from the 1980s, 1990s, and the 2000s. Students compare the results from the different time periods to determine the type of relationship and the strength of the correlations. This lesson is suitable for Algebra II, Pre-Calculus, or Statistics as an application of regression and correlation. Do relationships between two variables always stay the same? If we selected different time spans, such as 1985 to 1995 or 2000 to 2007, would the results of the regression vary and why? If we selected historical time periods (Great Depression, WWII, Invention of Personal Computer, etc. ), would the results of regression vary and why? 1. Review the key points in the lesson with the following questions. g. Remind students that correlation does not mean causation. Although unemployment and inflation are correlated, a change in one does not cause a change in the other. Beginning with the work of A.W. Phillips in the late 1950s, economists have debated a potential causal relationship between inflation and unemployment. In this lesson students have the opportunity to work with real data and discover what, if any, short term relationship exists within a decade and compare the regression and correlation (r) between different decades. Students will evaluate the relationship between inflation and unemployment for a short run time period. 2. Display Slide 3. Introduce and define inflation – A sustained rise in the general price level for all the goods and services produced in an economy. 3. Distribute Activity 1, and give students a moment to review the questions. Explain they will fill in the blanks as they watch the video. 5. Review the answers to the close activity using answer key for Activity 1. 6. Ask students to complete the quiz provided with the video. Review the answers. 7. Display Slide 4. Introduce and define unemployment as the number of people 16 years old and older who are without jobs and are actively seeking work. 9. Display Slide 6. Review the definitions of Positive and Negative (Inverse) Relationships – Explain that if there is a positive relationship between variables, when one variable changes, the other moves in the same direction. Explain that if there is a negative (inverse) relationship between two variables, when one variable changes, the other variable moves in the opposite direction. 10. Display Slide 7. Utilize the Phillips curve pdf found at www.econedlink.org/lessons/docs_lessons/850_T12.pdf, to explain the relationship between unemployment and inflation in the 1960s. 11. Display Slide 8 and discuss the following. a. What do you notice about the graph in years 1964 through 1969? [For this short time span, as inflation is increasing, unemployment is decreasing. There is a short-term negative relationship between the two variables]. 12. 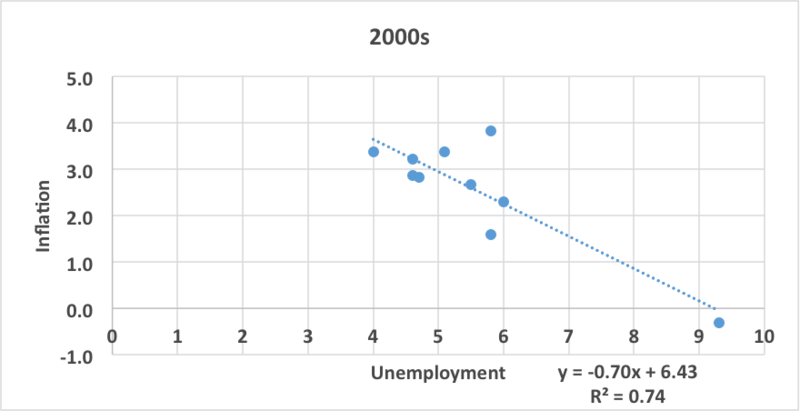 Explain that some argued that the relationship found in the Phillips curve was causal; that is, by allowing a little more inflation, policy makers could reduce unemployment. 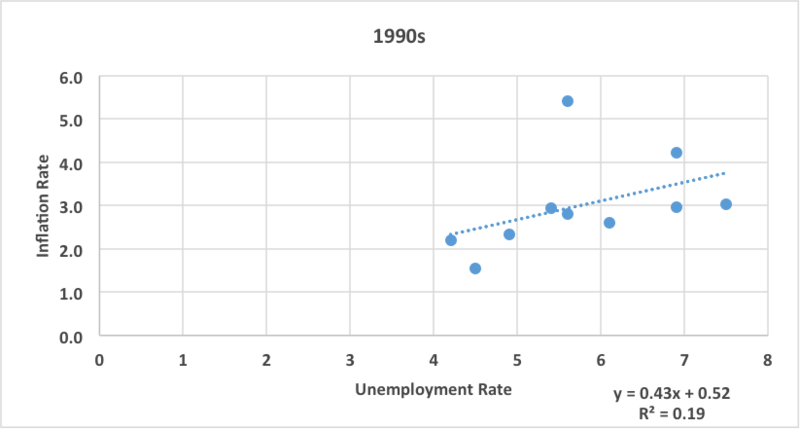 Tell students that today they will investigate data from several decades to determine whether there is a correlation between the two variables for those decades and to determine if the Phillips curve is causal. 13. Review prior knowledge on Correlation (r) found in a regression analysis. Explain that correlation (r) represents the relationship between two variables. The value of correlation (r) can only be between 1 and -1, strong correlations are closer to 1 or -1, while weak correlations are closer to 0. 14. Distribute a copy of Activity 2 to each student. 15. Display Slide 10. 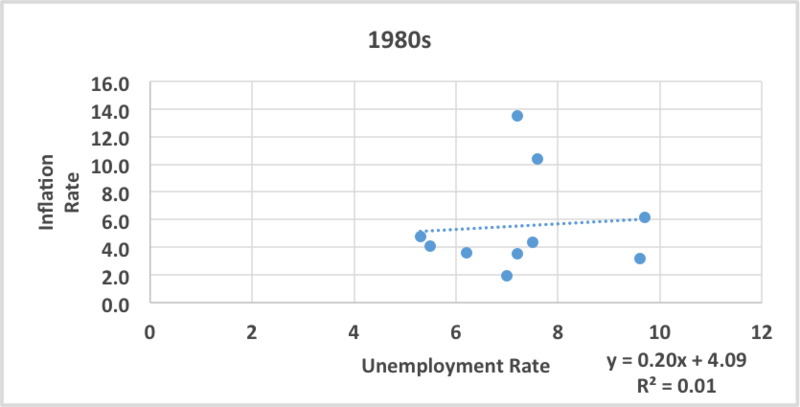 Using the unemployment and inflation (CPI) data provided for the 1980s in Activity 2, instruct students to follow along as you work through how to create a scatterplot in Excel and calculate the regression line equation and correlation coefficient for the relationship between the two variables. c. Display Slide 11. To produce a scatter plot select the area containing unemployment and inflation. e. Choose scatter, hover to show then select option for Scatter with only Markers. j. To find the regression line and its equation, click on chart, go to layout, choose Trend lines, scroll down to more trend line options, choose linear, automatic, and display equation on chart, hit close. k. Select and move equation to side. l. To find the correlation (r), click on Data, then Data Analysis, scroll down and select Regression. Hit OK.
m. Click into the input Y range box, then go back to spreadsheet and select the Change in CPI (Inflation) data column of information. n. Click into the input X range box, then go back to the spreadsheet and select the Unemployment data column of information. p. Display Slide 12. Point out to students that their graph should look like the one on Slide 12. See below. 17. Display Slide 13 and distribute a copy of Activity 3 to each student. Instruct students to create a scatter plot using these data. Allow time for them to create scatter plot, regression line equation, and correlation coefficient (r) as done with the 1980s data as a class group. 20. Display Slide 15. Compare data and results of both graphs. 21. Display Slide 16 and provide each group/pair of students a copy of Activity 4. Allow time for them to create scatter plot, regression line equation, and correlation coefficient (r) for the 2000s data, just as done with the 1980s and 1990s data. 22. Display Slide 17. Point out that their graph should resemble the graph on the slide.